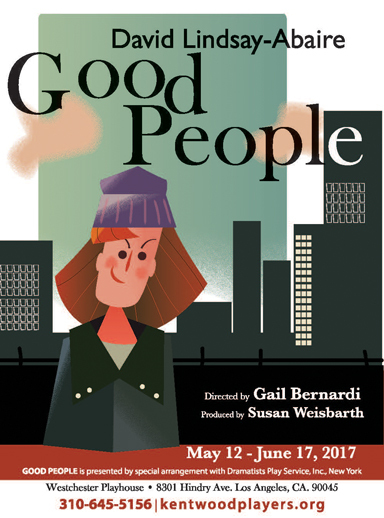 Good People centers on life in South Boston, a working-class neighborhood on hard times, which is no joke for single mother Margaret Walsh. Fired from her job, facing eviction and with nowhere to turn, she and her grown, disabled daughter, represent a large portion of today's society. Will she get a break from her young manager at the Dollar Store or the landlady with a craft business selling googly-eyed rabbits, or the man from her past, now a successful doctor, who left town at a crucial moment long ago? With cutting humor and amazing realism, Pulitzer Prize-winning playwright David Lindsey-Abaire creates a loving portrait of his hometown and a relatable story of socioeconomic struggle. In the world of Good People, acts of sacrifice and gestures of kindness come at the most surprising moments and from the most unexpected sources, posing questions we often ask ourselves; how important is the element of luck vs. hard work in any of our lives, and what constitutes the fine line that blurs both ideologies? Three best friends deal with their tough lives in South Boston. Jean, Margie and Dottie enjoy a morning coffee klatch. Best friends Jean and Margie enjoy a heartfelt laugh over coffee. Kate welcomes Dr. Mike home from a tough day at the office.